Edna Andrade’s art transcends the “Op” label, revealing her fascination with mathematics, psychology, and the inner workings of nature. “I feel as if I didn’t take charge of my life until I was middle-aged,” recalled the American artist Edna Andrade. A late bloomer, Andrade only began to create the work she is known for when she was in her 40s, after divorcing her husband in 1960 and taking a job as an art teacher. But she was no latecomer to art as a pursuit. When she was only 17, the Virginia native came north to Philadelphia to study at the storied Pennsylvania Academy of the Fine Arts, and while she was still in her 20s she became an art teacher at Sophie Newcomb College, the women’s division of Tulane University in New Orleans. Andrade was painting in a style influenced by Surrealism and by the intensely figure-oriented pedagogy of PAFA and had yet to truly find herself as an artist. But before she could do so, marriage and the start of World War II combined to put her creative career on hold for almost 20 years. 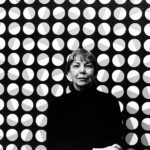 Born Edna Wright in Portsmouth, Va., in 1917, she was the daughter of a civil engineer, and the complex truss structures of the bridges he built are clearly visible in some of the Op Art abstractions she painted decades later. Her husband, C. Preston Andrade, whom she met in Philadelphia and married in the summer of 1941, was also a man who built things—an architect. During the war, both spouses found work commensurate with their special skills, he with the Navy’s Bureau of Aeronautics and she with the OSS, where she designed instructional documents and maps, working in a unit headed by Eero Saarinen. The simple, bold graphics of these projects were also an important ingredient in the crystallization of Andrade’s mature painting style. (She also worked on propaganda films with John Ford.) After the war, she went to work with her husband in his architecture firm, where she played the role of drafting assistant. While the work of those years was essentially unfulfilling and self-erasing, she absorbed important lessons from it that she later put to creative use. “A lot of the precision that came from that sort of drawing stayed with me,” she recalled. Overall, she felt that her marriage was stifling her potential and sapping her energies, and later described herself as “a very unliberated housewife” in the ’50s. Liberation came with the divorce, although that also imposed on Andrade a need to support herself financially. When she was hired as a teacher at the Philadelphia College of Art in 1960, not only was that problem solved but a creative breakthrough took place that was precipitated by the very act of teaching. In acquainting her students with the basic building blocks of form, color, and geometry, Andrade suddenly felt freed from the constraints of her own conservative art training at PAFA, whose realist-figurative tradition had weighed heavily on her in terms of self-expectation and led to a sort of blockage. All of a sudden, Andrade found herself using form and color directly, abstractly, and with a sense of freedom. During the ’30s and ’40s, she had become familiar with the formalist writings of Paul Klee and Josef Albers, and these theories had percolated within her until she was ready to use them. Now, almost overnight, she had become an abstract painter. The turn to abstraction also had something to do with the experience of work for women in a sexist society, and with Andrade’s own personality. She pointed out that because of her obligations as a wife and a worker, she did not have the ability to work on a painting for long stretches at a time, and therefore she gravitated toward a method of working that was founded on grids, so that she could plot out a pattern and then fill it in bit by bit, pausing when she had to and returning to it when she could. She related this modus operandi to knitting, needlepoint and other skills that were typical of women’s work in many societies. Extending the argument, she stated that her work was therefore bound to be more emotionally restrained than the dramatic, poetic gestures of Abstract Expressionists such as Jackson Pollock. “I had such a limited amount of time that I had to invent a way to paint that didn’t just…depend upon my mood,” she recalled. “Something that was more like a program than a spontaneous expression of feeling.” She also strove to make her art impersonal, in the sense of not being an expression of her personality, by such means as the elimination of visible brushstrokes. Andrade’s abstractions from the early and mid-1960s are highly precise, geometrically intricate, and rich in bold contrasting colors. What she was aiming at was achieving dynamism. In one of his Bauhaus lectures, Klee had spoken of motion as “the root of all growth,” and Andrade knew from her studies of color theory that contrasting hues placed next to each other in repeating, rhythmic patterns could convey a sense of motion. She was moving in her own life, and the images she was making at the time appear to be constantly on the move, as well. 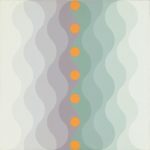 Some of these works, such as Color Motion (1964, a screen print rather than a painting), Radiant Ellipse (1965), and Turbo I (1965) function very much as Op Art typically does, producing an illusion of pulsation that leads to an almost hypnotic receptivity. Others are more serene, conveying the kind of dynamic tension of motion-within-stillness that characterizes a structure such as a bridge or building. Geometric 4-63 (1963), in bright colors, and Space Frame (1965), in black and white, both exemplify this latter category of quasi-industrial abstractions. In the late ’60s, Andrade found a different way to express motion, not through powerful lines of force emanating from a center, as in the Op works, but in a way that diffuses the motion all over the painting, so that the eye itself moves all over without being made to stop in any one place. 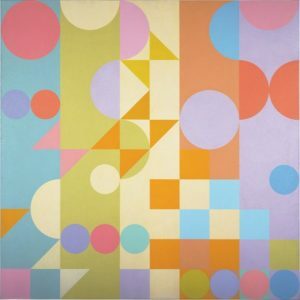 For example, in Emergence II (1969), Andrade fills a grid with tiny circles divided into white an gray halves. The circles are all at different orientations, giving the sense of seeing a sequential or comic-strip depiction of a wheel rotating. This is a clever updating of the Futurist strategy of showing all states of a movement simultaneously. 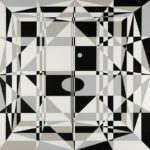 Op Art became wildly popular with the Museum of Modern Art’s show “The Responsive Eye” in 1965, which cemented the reputations of Bridget Riley, Richard Anuszkiewicz, Victor Vasarely, and several others. Andrade was not included in that show, because at the time it was being organized, she did not have gallery representation and was unknown to the curator, William Seitz. Conversely, the work of the Op artists was more or less unknown to Andrade, who had been working in isolation. Andrade benefited from “The Responsive Eye,” in the sense that the exhibition, which got a tremendous amount of press, increased the art market’s appetite for optically oriented abstraction, and dealers starting showing interest in her. In 1967 she got a solo show at the East Hampton Gallery in Manhattan. The reviews were not especially warm, though; New York Times critic John Canaday damned Andrade with faint praise, describing her work as a lower-energy version of Riley’s. Andrade herself resisted the Op label, on the grounds that her art aimed at doing far more than tickling the optic nerve. 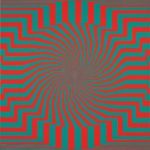 The very term “Op Art,” she told an interviewer at the time, “could be the kiss of death. It’s too simple. It seems to refer too directly to the physiology of the eye. It fails to suggest that we are exploring the whole process of perception.” Andrade was also out of sympathy with Minimalism, which was associated, at least in the art media, with Op. These ambitions, lofty as they were, never led Andrade into Olympian attitudes. She was always attracted to the humility of crafts: “I feel a kinship with the anonymous artisans of the past who painted pots and tiles, wove baskets and carpets, stitched vestments and quilts,” she wrote. 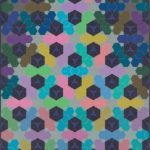 “They send me precious messages without words.” In the 1980s, inspired by the tile work she saw on a trip to India, she made acrylic on canvas paintings and screen prints such as Temple (1984) that exploit the graphic and color possibilities of tessellation. In addition to making screen prints of some of her Op images, she also collaborated with a toy company to render them as jigsaw puzzles. Andrade’s interest in “ancient traditions” of craft put her in sympathy with the Pattern & Decoration movement of the late ’70s and ’80s, which, in a feminist spirit, celebrated culturally diverse textile arts that have traditionally been considered “women’s work.” While she was not part of the movement, Andrade did exhibit with some of its prominent members, such as Joyce Kozloff and Miriam Schapiro. From 1971 on, Andrade was represented by Locks Gallery in Philadelphia, where she lived and worked until her death in 2008. Her interest in nature became more clearly visible over time. In the ’70s she made dark, nearly monochrome acrylic paintings that seem to depict the night sky filled with vibrations of cosmic energy, like sine curves. Other works are based on linear elaborations of the color spectrum. In the ’90s, Andrade made a dramatic change, doing graphite drawings and oil paintings of rock formations that she observed along the Maine coast. For the first time in half a century, she was painting figuratively again, but this time without any sense of being beholden to someone else’s concept of how it should be done. With their painstaking attention to every crevice and contour, these late works are on the same quest as her abstract geometrical works—for attunement with nature and all her mysteries.